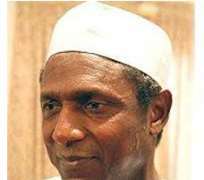 The family of President Umaru Musa Yar'Adua said yesterday that it would not hesitate to institute legal action against any media house that continues to report the president's health maliciously. A statement signed by "The President's Sister", Hajia Mairo Musa Yar'Adua, on behalf of the family said its attention has been drawn to "the false, malicious and obviously sponsored media reports that suggested that the president's mother, Hajia Dada Habib Yar'Adua asked Mr President to resign from office on account of ill health." The reports, according to Hajia Mairo insinuated that Hajia Yar'Adua is disagreeing with the President's wife, Turai, whom the newspapers claimed was urging the President to sit tight, saying there was no time that the president's mother suggested so. “To put the records straight, the President's mother has never spoken to the media. She enjoys a cordial relationship with her daughter-in-law, Turai. The president's mother contrary to media reports is supportive of Mr President's foray into politics and has always encouraged him to render selfless service to the good people of Nigeria,” the family said. The family also said that instead of the media turning itself into malleable tools of "blackmail by disgruntled politicians" it should rather "cross check facts before going to press” most especially at “this critical stage of the nation's development." Sequel to this, Hajia Mairo Yar'Adua has instructed all the media houses “responsible for these falsehoods to retract the misleading reports and apologize to the family or face legal action”.